Thank you for visiting Conner, Inc.!!! We're in the continual stages of updating our site with information that will be beneficial for you. Feel free to check out our Plumbing & HVAC sections to learn about how we can best serve you. 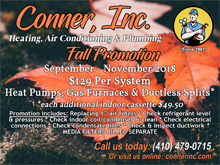 If you need to get in contact with Conner, Inc., click here! !